I have always wanted a Le Creuset pot. But I never really experienced what it was like to cook with one until very recently. Over the summer, I made lamb shank and bolognese in my sister’s bright orange Dutch oven. My brother-in-law’s favorite thing is tender meat. I was able to please him and discover the pleasure of cooking with a Le Creuset. The fact that I could just dump all the ingredients in the pot and let it simmer away without paranoid checks on liquid level was liberating! I finally got my own red French oven for my birthday! 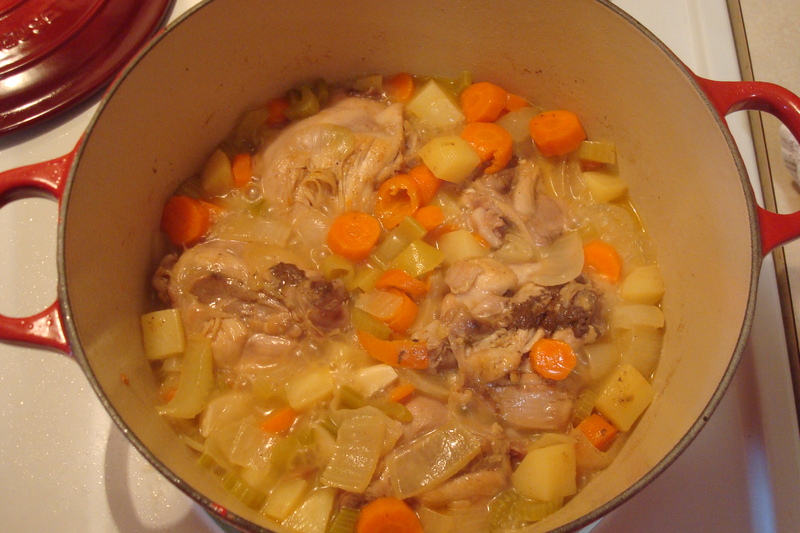 I decided to make chicken stew with carrots, celery, onions, potatoes, garlic, herbs de Provence, a bay leaf, and white wine. The chicken became tender in no time and the stew was hearty and satisfying. Last night, I was reheating the leftovers and decided that I wanted to change the flavor profile. I remembered a tip R had told me a couple of weeks ago. He said that he adds a spoonful of kochujang into his chicken stew. So I got out a big spoon and plopped a generous amount of it into the stew along with fresh ginger, scallions, sesame oil, and sesame seeds. After mixing everything in, I tasted it. To my surprise, it was just like dalk tang, Korean chicken stew! Actually, what you’re thinking of is dak chim. Dak tang doesn’t exist in the Korean language as far as I know. Koreans call chicken soup dak guk in general or more specifically, samegye tang, if a small chicken is stuffed with lots of ingredients, including ginseng, glutinous rice, and chestnuts. You were apparently thinking of dak doritang, which many Koreans believe a tainted word (not pure Korean); dori supposedly comes from the Japanese.